The best virtual Leslie we've come across to date, LX122 Premium is another brilliant effects bargain from XILS-lab. Impressively versatile. Highly detailed control. Wide range of cabinets Lush sound. Big CPU hit hampers live use. GUI lets things down. "The 'Leslie' cabinet used rotating speakers inside a wooden cabinet with a hole in it to create a Doppler effect"
Back in 1937, a man named Donald Leslie bought a Hammond organ. He didn't like the sound, so he spent three years developing the 'Leslie' cabinet, which used rotating speakers inside a wooden cabinet with a hole in it to create a Doppler effect. The most well known models - the 122 and 122RV (with reverb) - featured an electromechanically powered rotating horn for the upper frequencies and a fixed woofer pointing down towards a belt- driven rotating baffle for the lower ones. It is from these models that XILS-lab's latest vintage recreation, LX122, gets its name. There are two versions of LX122 available: Premium, which we're reviewing here, and the standard version, which costs €39. The cheaper version has a lot of stuff missing, so we'll start by saying that we'd absolutely recommend spending the extra €30 to get the full enchilada and the much broader range of sounds it allows. There are three sections to LX122. The omnipresent Main Panel section offers gain control, wet/dry mix and a drive function for saturating the signal before it hits the cabinet modelling. An optional Dual mode treats the two channels independently, turning the plugin into a four-speaker unit. It's less bass-heavy, so brighter, but it takes a lot of processing power. Though LX122 isn't what you'd call CPU-friendly at the best of times, it's the kind of effect that loses impact if you use it on too many sounds in a track anyway. Wrapping up the Main Panel are buttons to switch the rotation speed (Slow/Fast/ Stop) for the horn, drum or both. Since Leslie cabinets are performance tools, these controls can be mapped to MIDI controllers for automation or live performance. In the Studio area, you can set the room size, wall type, mic distance and mic angles, and apply reverb. You can tailor the room for a beautifully realised sense of live space or disable it for purer digital effects. Next comes the Cabinet settings area, providing five Leslie configurations, each with its own character suited to different types of signals. For example, the '1 Horn, 1 Woofer' model is great for drum loops as it doesn't modulate the bottom end at all. "Whatever kind of music you make, LX122 Premium could easily become a regular player in your production game"
Rotation controls are available too, of course, offering adjustable speed, acceleration, deceleration and brake strength. You can even set the age of the drum ribbon (driving the baffle) and the horn diameter (to control the strength of the Doppler effect). Additionally, you can set the rotation direction of both the horn and drum units to clockwise, anti-clockwise or even random. Finally, the Diffuser Out control emulates the removal of the metal part of the horn by real- world Leslie owners, which makes the sound a tad less bright and metallic when engaged. 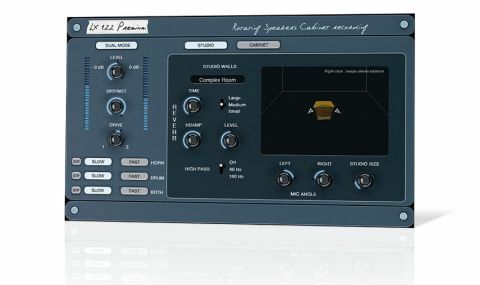 Our only complaint about LX122 Premium is that the GUI is quite uninspiring and sometimes fiddly to operate - apart from that, we've been spinning out over this plugin. Phasing, flanging, tremolo and chorusing plugins have seemingly obviated the need for Leslie hardware in recent times, and many of the 'rotary' effects on virtual Hammond instruments are little more than tremolo with a fancy interface, so it's been easy to forget just how lush and versatile a proper Leslie is. Whatever kind of music you make, LX122 Premium could easily become a regular player in your production game.